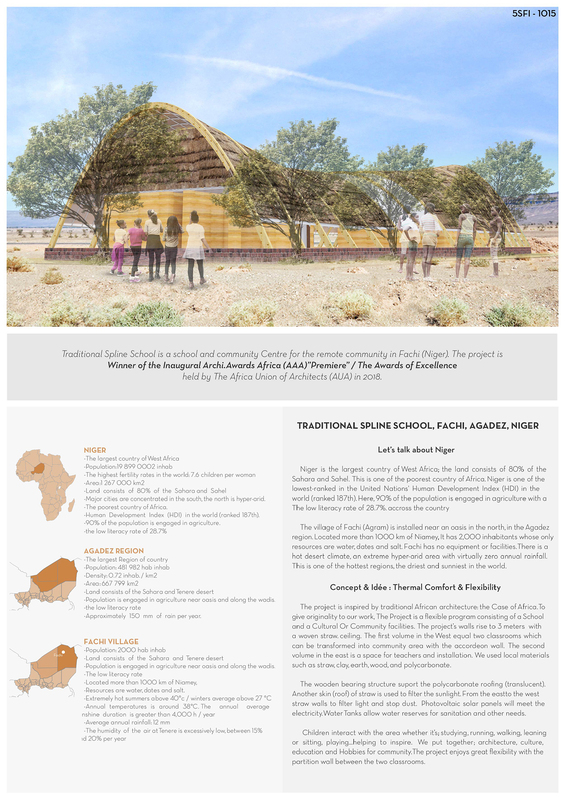 Traditional Spline School is a school and community Centre for the remote community in Fachi (Niger). The project is Winner of the Inaugural Archi.Awards Africa (AAA)”Premiere” / The Awards of Excellence held by The Africa Union of Architects (AUA) in 2018. The village of Fachi (Agram) is installed near an oasis in the north, in the Agadez region. Located more than 1000 km of Niamey, It has 2,000 inhabitants whose only resources are water, dates and salt. Fachi has no equipment or facilities. There is a hot desert climate, an extreme hyper-arid area with virtually zero annual rainfall. This is one of the hottest regions, the driest and sunniest in the world. The project is inspired by traditional African architecture: the Case of Africa. To give originality to our work, The Project is a flexible program consisting of a School and a Cultural Or Community facilities. The project’s walls rise to 3 meters with a woven straw. ceiling. The first volume in the West equal two classrooms which can be transformed into community area with the accordeon wall. The second volume in the east is a space for teachers and installation. We used local materials such as straw, clay, earth, wood, and polycarbonate. The wooden bearing structure suport the polycarbonate roofing (translucent). Another skin (roof) of straw is used to filter the sunlight. From the eastto the west straw walls to filter light and stop dust. Photovoltaic solar panels will meet the electricity. Water Tanks allow water reserves for sanitation and other needs. Children interact with the area whether it’s; studying, running, walking, leaning or sitting, playing...helping to inspire. We put together; architecture, culture, education and Hobbies for community. The project enjoys great flexibility with the partition wall between the two classrooms.